You don’t have to sacrifice style to keep your feet dry. Gloomy weather can make it hard to feel inspired about putting together an outfit, but with these three pairs of unique, stylish rain boots you can look awesome no matter what the weather is doing outside! One of my favorite ways to easily look fashionable and put-together is to wear a lot of black. 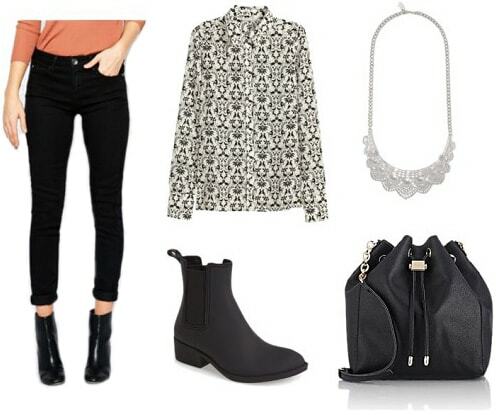 Bold printed tops are a huge trend this season, and these black jeans and ankle rain boots really allow this top to stand out. Bucket bags are also a big trend, and this black one adds a high-fashion element to this look. Throw on a statement necklace and you have an easy to put together, but still very fashion-forward outfit! 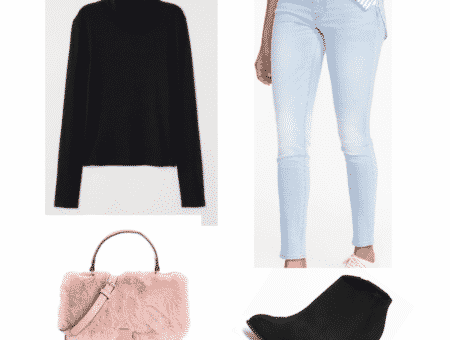 This casual look is perfect for those gloomy days where you still have to go to class but want to remain comfortable. Lace up tops are everywhere right now, and I love how this loose fitting one is a bit more casual than the usual form fitted ones. Throw on some distressed jeans to keep the look casual, a small cross body bag, and a statement watch and you are ready to go! How amazing are these ankle rain boots? They hardly even look like rain boots at all! I paired these with a pair of dark wash jeans and a pinstripe shirt (stripes are another big trend for this spring season). 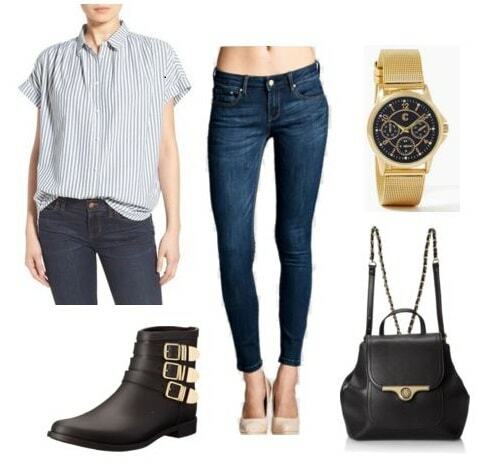 To match the gold detailing in the boots, you can pair a large statement watch with this look and a backpack with gold detailing to keep your hands free. 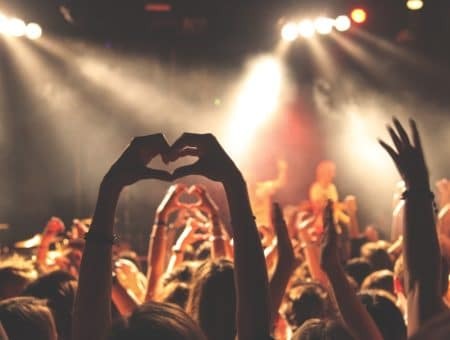 Remember: Even though rainy weather may not be your favorite, it does mean that summer is on the way. All you need now is a super cute umbrella and you are ready to go! 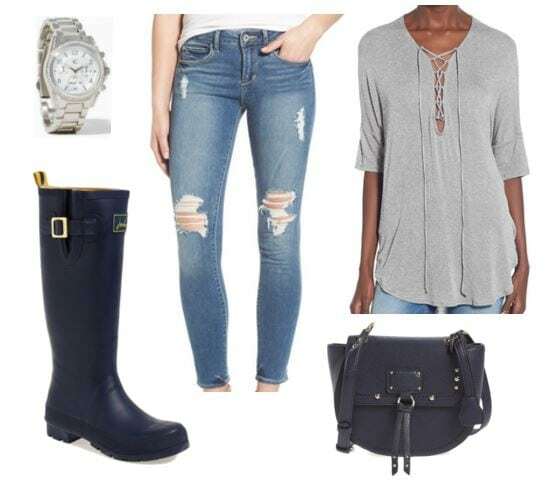 Do you have a go-to look for rainy days or a pair of rain boots you can’t get enough of? 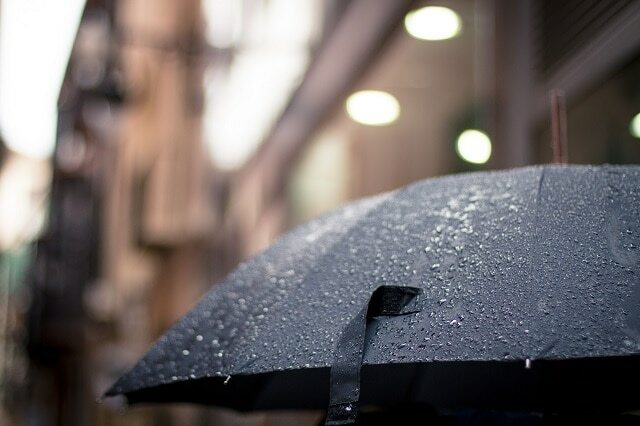 Let us know in the comments and stay dry this spring!